Our autism awareness shirts are perfect for your next fundraising event or walk! The unique design will help you stand out and educate others about how important it is for everyone to understand the autism spectrum. The personalized touch on the t-shirt will also help you show to support to loved ones diagnosed with autism. 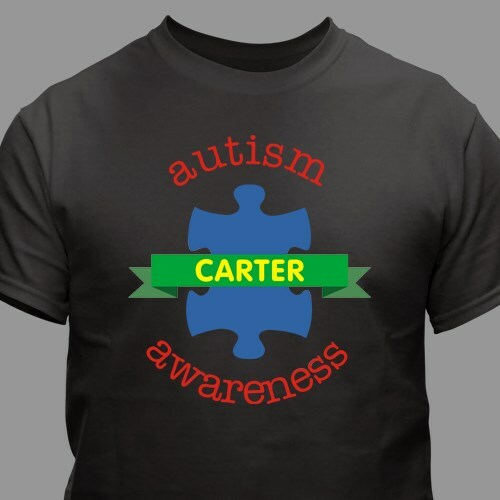 This autism awareness design is featured on our premium, 100% cotton, machine washable t-shirts. Available in youth sizes XS-L & adult sizes S-3XL. Free personalization of any name is included. The shirt is a great fit and the logo is clear and positive. I especially like that shirt can be personalized with child's name! Additional Info Show your passion and support for educating others about autism by buying some of our autism awareness apparel. We offer a selection of designs that will look great for any personality or message you'd like to spread. A portion of your proceeds will go to the charity or organization of your choice.